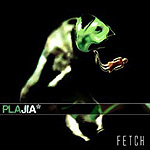 Plajia are a four-piece band from Montreal, Canada and "Fetch" is their mini-album debut. The album contains eight tracks, which bleed into one another in a way that makes the whole album sound like one continuous track. Radiohead are among the band's influences, which goes a long way in explaining why the album is drenched in monotonous melancholy. Experimental backing sounds including an alarm clock, whistles and a dog barking, add little to the over-all context of the songs and appear to be thrown in simply for the sake of it. Patrick Pleau not only provided the vocals, acoustic guitar and piano, he also engineered and mixed the album and designed its rather impressive album cover, an image of a dog with a person wrapped around it tongue, which looks like it's being viewed through night-vision goggles. Perhaps Pleau spread himself too thinly and as a result the quality of the songs suffered. The acoustic track at the end may be an indication of the direction the band should be taking. As they stand, Plajia are little more than a poor-quality Radiohead. Fetch? I'd say don't bother.